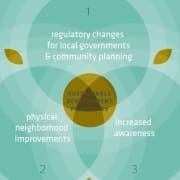 Global Green's experience has shown that it is crucial that plans and improvements fully integrate local context, perspectives, and knowledge.Therefore, cities should utilize a combination of technical expertise and local stakeholder engagement strategies to respond to these resilience issues at the neighborhood level. We're seeking help from volunteers with experience in research, communications and/or media - or who are deeply rooted in their local companies and seek to help build a program. As a new component to the program, we're also seeking to work with individuals who are seeking to bring the program to their neighborhood. Volunteers will have an initial phone call with Global Green staff, and then meet in person in Dallas the weekend of April 27-28.